Durmitor National Park is a phenomenon so rich in diversity and beauty that it must be seen and experienced first-hand to be believed. Spread over 39000 acres this UNESCO protected world heritage site is comprised of large, rocky massifs, plateaus, glacial lakes, alpine forests and grassy meadows supporting a wide range of rare and endemic flora and fauna. With over 48 peaks above 2,000 m, 18 glacial lakes (known as Gorske Oci or “mountain eyes”), 748 natural springs and a multitude of caves and jagged rocky ravines the backdrop is set for over 2000km of some of the world most spectacular hiking trails. The massif is limited only by the Tara River Canyon on the north, the Piva River Canyon on the west and by the Komarnica River Canyon to the south. Durmitor National Park is home to over 130 species of butterflies and 160 species of birds, including varieties of grouse, partridge, lark, Titmouse, hawk, kestrel, vulture, buzzard and Eagle. Newts, frogs and lizards share ground with deer, rabbit, fox, wild boar and chamois and there still exists small numbers of grey wolf and brown bear. Over 1300 varieties of plant species are there to be spotted and 40 types of wild edible mushrooms are there for the picking. On the massif’s lower slopes blueberries and wild strawberries can be picked from June to October. The park, which contains one of the last virgin black pine forests, is habitat to softwood trees such as spruce, fir and pine, deciduous trees such as birch, beech, aspen and maple and lower regions of ash, oak, elm and linden. Rare species include white bark pine, yew, Kalika, mugo and dwarf pine. 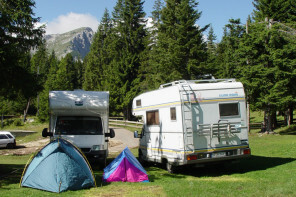 I am very happy with the service and the natural environment that provides camping at Razvršje. When deciding we were a little unsure but upon arrival it was evident that he made a good choice. We will surely come back again. 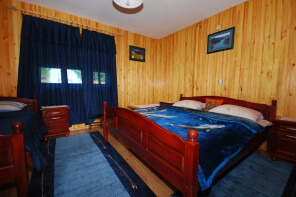 I stayed for 3 nights at Durmitor Autocamp and had a great time. 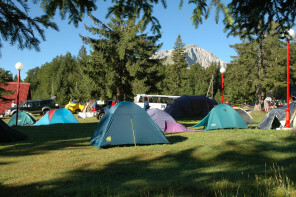 The food the camp provided was excellent and the location is great - close to the Black Lake and to town but in beautiful surroundings. I look forward to being back. I am a great friend of the family with Mischa Voinovich and every year my family comes from Belgrade on vacation in the beautiful nature of Zabljak and the environment. Miso offers hospitality without reserve, honestly and with whole heart.